Assistant Attorney General Leslie R. Caldwell of the Justice Department’s Criminal Division; U.S. Attorney Carmen M. Ortiz of the District of Massachusetts; Hampden County, Massachusetts, District Attorney Anthony Gulluni; Special Agent in Charge Harold H. Shaw of the FBI’s Boston Division; and Colonel Richard D. McKeon of the Massachusetts State Police announced. Ralph Santaniello, 49, of Longmeadow, Massachusetts; Giovanni Calabrese, aka John Calabrese, 53, of Longmeadow; Gerald Daniele, 51, of Longmeadow; Francesco Depergola, 60, of Springfield, Massachusetts; and Richard Valentini, 51, of East Longmeadow, Massachusetts, were each charged with one count of collecting on an extension of credit by extortionate means. In addition, Santaniello, Calabrese and Depergola were each charged with one count of extortion by threat of physical violence; and Daniele was charged with two counts of making extortionate extensions of credit and one count of collecting on an extension of credit by extortionate means. 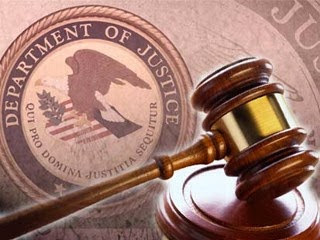 According to the indictment, the defendants were associates of the Genovese LCN crime family in New York and committed various criminal activities in Springfield, including loansharking (e.g., the making of unlawful loans and extortionate extensions of credit); extortion from persons who were involved in legitimate and illegitimate businesses, including illegal gambling businesses; and the collection of unlawful debts. In conducting their illegal activities, the defendants allegedly used violence and, exploiting their relationship with the LCN, implied threats of murder and physical violence to instill fear in their victims. The indictment alleges that in 2013, Santaniello, Calabrese, Depergola and Valentini attempted to extort money from a Springfield businessman. Santaniello allegedly assaulted the victim and threatened to cut off his head and bury his body if he did not comply. Over a period of four months, the victim paid $20,000 to Santaniello, Calabrese, Depergola and Valentini to protect himself and his business. Additionally, according to the indictment, during a six-month period in 2015, Daniele allegedly extended two extortionate and usurious loans to an individual, and then, with the assistance of Santaniello and Calabrese, threatened the individual if he did not make payments on the loan. Individuals who believe they may have been victimized by the defendants should contact the FBI at (413) 732-0159. The FBI Springfield Division’s Organized Crime Unit and the Massachusetts State Police’s Police Detective Unit assigned to District Attorney Gulluni’s Office and State Police Special Services Unit investigated the case. Chief Kevin O’Regan of the U.S. Attorney’s Office of the District of Massachusetts’ Springfield Branch Office and Trial Attorney Marianne Shelvey of the Criminal Division’s Organized Crime and Gang Section are prosecuting the case.